​There is a reason why the piano became so popular. Along with the guitar, it’s an instrument that doesn’t require musical accompaniment. Many musicians have built their careers as a solo act, on the piano. The sound and expressiveness of the piano have enabled it to stand out and become what it is. Throughout the years, many composers created wonderful pieces for the piano. And the tradition continued well into the twentieth century. Even today, the piano is considered the king of all instruments. 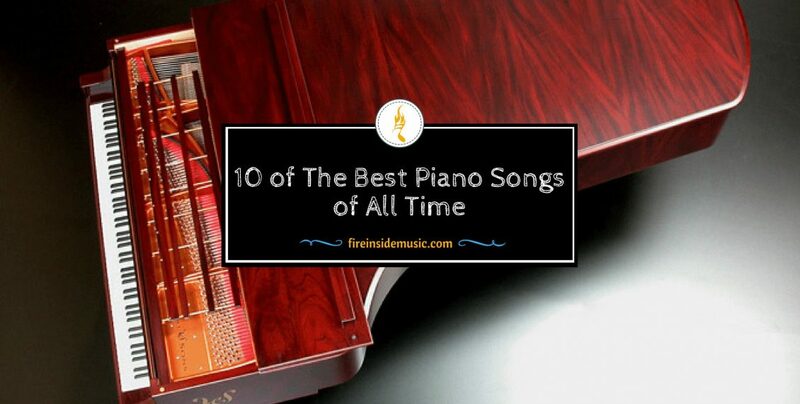 In this article, you will learn more about the best piano songs of all time. We will include both classical compositions, as well as pop songs for the piano. Let’s begin! Although it became popular under this name, the original title of this piano piece was the Piano Sonata No.14 in C# minor “Quasi una fantasia”. Beethoven dedicated this composition to one of his pupils, and he finished it in 1801. The original title of this composition can be translated as “almost a fantasy” and it really sound that way. It’s magical and inviting, and it enchants both the audience and the performer. Moonlight Sonata was a favorite among students of music and the audience. To borrow a modern term, it was a real – “crowd pleaser”. It’s straightforward and simplistic in its nature. It doesn’t require virtuosity in order to be played, because it’s more focused on the feel and atmosphere the player creates. Yoko Ono, as she played the piano. She was playing Moonlight Sonata. Lennon liked the theme so much, that he decided to write something in that style. That’s how “Because” came to be. The Beatles were revolutionary in everything they touched upon, including the piano. This song was composed by Paul McCartney. It was originally called “Hey Jules”, as McCartney dedicated it to John Lennon’s son, Julian. But he later changed it to “Hey Jude”, because it was better for the rhythm of the song. Right from the start, the song was meant to be played on the piano. Paul McCartney composed directly on the piano, and he preferred to keep it that way. When George Harrison wanted to play some guitar on top of the piano line, McCartney was against it. He claimed that it would rob the song intro of its musical appeal. And he was definitely right. The structure of Hey Jude is pretty simple. It used only a handful of chords, and the changes are smooth. This is why it’s a very easy song to learn and play. Nevertheless, it’s enjoyable both for beginner players and more experienced pianists. It also has a memorable coda i.e. song ending. It ends with a sing-along that can include audience members. This is also one of the reasons why Hey Jude remains a popular party piece. If you want to call yourself a good pop pianist, be sure to learn Hey Jude. This composition is the second in the set of three nocturnes which Frederic Chopin wrote for Camille Pleyel. Nocturne is a musical term given to compositions which are evocative of nighttime and nighttime feelings. The whole set of nocturnes is one of the best works by Chopin. However, the second one really stands out. It is also one of the most recognizable works by this composer. The composition was made in the so-called rounded binary form. This means that there are two musical sections which are related, and they are repeated. The composition ends with a coda. The nocturne begins with a famous theme played on the higher keys, which repeats a couple of times. What also significantly contributes to the feel it the time signature. The waltz-like rhythm of the nocturne adds to the overall dream quality. The key thing when playing this piece is not to speed it up. Many inexperienced players fall into this trap. It’s very easy to speed up compositions that are meant to be played at a slow pace. The player naturally tends to make the song go faster, but it often does nothing but destroy the feel of a musical piece. Nocturne No. 2 is one of the most performed piano compositions of all time. It should definitely be in the arsenal of every aspiring piano player. It’s a nice introduction to the world of classical piano compositions. This composition was created for the soundtrack of the movie “Piano” from 1993. From the moment the movie premiered, this composition became legendary. It was even covered by the band Nightwish in 2012. What this composition managed was to combine classical virtuosity with popular appeal. That’s why many people recognize it, even though they are not into classical music at all. Although it beautifully elevates the sound on the piano, this composition can prove quite tricky to play. In order to play it well, a pianist has to have a great technique. Both hands are used extensively, and there is no room for “resting”. The performer has to be involved from the very start up until the very end. This is why many pianists don’t dare to play it until they are highly proficient. However, when a player learns how to play it – it’s a real gem. “The Heart Asks Pleasure First” is one of those songs that are meant to be played on the piano. Don’t be intimidated by the work you have to invest in playing it. It will be worth it in the end. This is one of the most famous compositions of all time. It is certainly in the top 10 pop songs ever recorded. But it’s not only a pop song. It transcends all genres, becoming an anthem for humanity. And it has been covered by numerous artists over the years. Following John Lennon’s simplistic approach to music, Imagine is a pretty simple song. The intro has only two chords, and the entire song has six chords. The tempo is moderate, as the song gradually develops. It doesn’t include big changes, or grandiose dynamics – but it’s certainly a masterpiece in its own right. Simplicity is precisely what makes this song amazing. It doesn’t feel forced in any way. The chord “pour” one into another naturally, yet the song doesn’t sound “loose” in any way. The structure is tight, the chords are in their place, and they really contribute the lyrics. Imagine is definitely a great example of fantastic composing for the piano. This song can be played on a guitar, and it will sound – okay. But it will never be what it’s supposed to be unless you play it on the piano. And if it’s a grand piano, that’s even better. Be sure not to miss this one. This composition is a part of triptych named the Gymnopedies, which was published in Paris by Erik Satie. Satie’s motivation for writing this piece is very interesting. He actually wanted to distance himself from the popular music of the time. The so-called “salon music” was the most famous genre of the late nineteenth century. However, Erik Satie desired to achieve something else. That is why Gymnopédie No. 1still sounds fresh today. It sounds as if it was written just recently. This composition is one of the first pieces of ambient music ever written. It’s in ¾ time signatures, and its tempo is very slow. It doesn’t feel rushed – on the contrary. The composition literally “takes its time” as it slowly unfurls. It is very relaxing and “dreamy”. It doesn’t require speed in order to be played. Nevertheless, the player has to be fully concentrated in order to deliver. Gymnopédie No. 1 is still a mesmerizing piece of piano music. It captures your heart like no other classical piano composition. It also influenced a great number of composers today. It gave inspiration for many composers of video game music, with its ambient nature. If you listen closely, you will hear similar compositions in many video games, and even some commercials. Elton John is a musician famous for his piano songs, both up-tempos and ballads. Although it’s hard to pick the best piano song of his, “Tiny Dancer” is definitely one of the best. It was recorded in 1971, but it still sounds fresh today as when it first came out. The song is composed in a very interested way, and it not your typical pop song. It doesn’t have what musicians call a “hook” – a chorus or recognizable theme right from the start. In fact, it opens up slowly, but by the end turns into a magnificent composition. The piano has an important part in the whole composition, because it basically leads the melody and follows lyrics right through to the end. This is precisely why the song can be tricky to play, especially for novice players. Nevertheless, it has beautiful country-like harmonies. It also switches back and forth between slow, easy-going sequences and more dynamic bits. This gives it extra quality, making it one of the best piano songs ever. It doesn’t have the status that Imagine or Hey Jude has, but it’s definitely up there with the best. This is one of those compositions that cannot be imagined without the piano. If you removed the piano from, it would lose its magic touch. It was composed as part of the soundtrack for the famous French film “Amelie” which came out in 2001. The soundtrack was composed by the well-known composer Yann Tiersen. Tiersen became famous for his composing work for the piano and accordion. The movie “Amelie” is done to resemble a fairy tale and Yann Tiersen managed to capture that atmosphere with his music. The whole soundtrack really contributes to the film, but this composition is probably the best of the score. It starts off with the left-hand accompaniment, but then it develops into an intricate piece full of dream-like melodies. The whole composition plays soft and slow, but it capture the attention right from the start. It is just over two minutes long, but it sounds like a small symphony. This is one of the most beautiful pieces of music ever composed for the piano. If you’re into more complicated piano playing, the Amelie soundtrack is where to start. And this composition is such a treat. Coldplay is famous for piano-driven songs, and “Fix you” is no exception. Technically, this song is written and played on an organ, but it sounds like it’s made for the piano. There are also many covers of it on the piano. And the best thing is that it doesn’t require a band in order to sound beautiful. It was even performed live at the memorial service for Steve Jobs. Coldplay singer, Chris Martin, said that this is probably the most important song the band ever wrote. It is a ballad, that starts off very slow with only two exchanging chord. It takes its time before introducing a chorus, and then returns to the theme. The original recording is in E-flat major. It used both and organ and a piano. Just like “Imagine”, it’s impossible to do it justice on any other instrument. It’s great for beginner pianists, as the chord changes are slow, allowing time to switch between them. “Fix you” is a great entry point for all aspiring piano players. It’s easy, catchy and lends itself to singing along. It’s impossible to talk about best piano songs, and not mention “Für Elise”. It is definitely one of the most recognizable piano tunes ever composed. The original title for it was “Bagatelle No.25 in A minor”, but it later came to be known as Fur Elise. This composition was discovered in 1867 - 40 years after Beethoven’s death. Although it is not one of the fastest piano compositions, it is definitely hard to play. It involves a lot of movements, and several chords. It is relatively easy to play the first part of this composition. However, in the second and third part – you have to be well-versed in piano playing in order to pull it off. It is a combination of speed, precision and dynamics that makes Fur Elise a piano masterpiece. It is no wonder that Beethoven opens and closes this list. His piano compositions are among the greatest works of music art ever put to paper. It is impossible to all of the best piano songs in just one article. There are literally hundreds, if not thousands of beautiful songs for the piano. And we haven’t even touched upon many musical genres. Jazz, for example, has great piano songs. There are also fantastic piano compositions for the blues, and many other genres. This is just one possible list. From here, you can make your own search and find more songs for the piano.